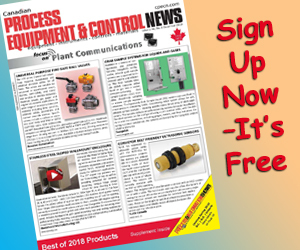 As part of the company’s core values of health and safety, environmental stewardship and continuous improvement, the team realized a need for additional flare gas meters to maintain the clean, safe operation of its facility. 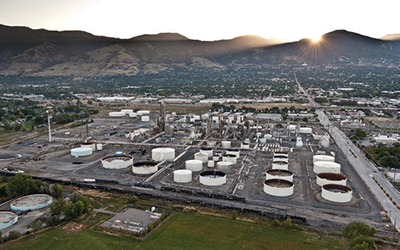 The refinery is located in a picturesque area with a population of 43,000 within commuting distance of metropolitan Salt Lake City. The company is proud of its safe operations. The feedstock is primarily from Western Wyoming, Utah, and Canadian Oil Sands. Refinery production includes gasoline and diesel products for the Utah, Idaho, Nevada, Wyoming, and Eastern Washington markets. New environmental regulations presented the plant team with multiple requirements including hydrogen sulfide monitoring and flare gas flow measurement. The team needed to measure gas flow on multiple feeder lines extending to the main flare header in order to monitor relief gas flow from each particular process within the refinery. A sudden increase in metered flow can be used to quickly locate the source of any process upset automatically. Therefore, operations staff members do not need to physically check each safety relief valve to determine the vent location. Immediate action can now be taken at the plant to pinpoint any problems and take corrective action. Low and High Flows. Sensitivity to low flow conditions is required to identify and measure leaking valves and the normal low flow associated in day to day operations. The capability to measure very high flows is needed during system upset conditions requiring a meter that needs to measure flow accurately over an extremely wide turndown range. Meter Calibration. This application requires the calibration of flow meters specifically for hydrocarbon composition gases and matching to actual process conditions is essential. Large Line Sizes. As pipe sizes increase, the number of effective and suitable flow meter sensing technologies decreases. Available Straight-Run. All velocity-based flow meter technologies have pipe straight-run requirements upstream and downstream from the meter in order to achieve accurate flow measurement. 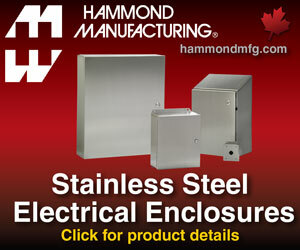 These straight-run requirements may not be available in crowded production sites and process plants. Limited Access. Access and re-access to piping for installation, maintenance or servicing is frequently difficult. For example, spool-piece flow meters can require prolonged process shut-downs and extensive on-site labor costs to install and continuously maintain the system as opposed to insertion style meters that can be easily inserted into or retracted out of the process through a ball valve. Agency Approvals. 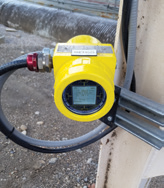 When installing meters in hazardous (Ex) locations, the entire flow metering instrument should carry agency approval credentials for installation in environments with potential hazardous gases; enclosure only ratings are inadequate. The Woods Cross Refinery plant team was interested in a reliable mass flow meter at reasonable cost that would require minimal maintenance and be easy to install. They had previously used an ST98 thermal mass flow meter from Fluid Components International (FCI) for flare gas measurement some 18 years earlier, which was still in operation and working well. The thermal mass flow meter was located in a flare gas line with potentially heavy sulfur content. Periodic inspection after 12 years showed some residue fouling to be present, but not enough to impact the meter’s rugged “S” sensor design for wet, dirty gas applications. The plant team determined that the meter was still trending well against the refinery process data, but had drifted to a slightly higher flow indication over the years. After recalibration and re-installation, the meter continued to perform like new. Installed ST100 mass flow meter from FCI. This long service record without any problems or maintenance led the plant team to contact the flow meter manufacturer’s representative firm La Tech Equipment for recommendations. The manufacturer’s representative firm recommended the manufacturer’s next generation ST100 mass flow meter with exceptional performance in flare gas applications. This meter is a state-of-the-art, thermal dispersion technology gas flow meter that combines feature- and function- rich electronics with proven flow sensor technology for exceptional accuracy and reliability. As part of the refinery’s efforts to minimize flaring, six of the new thermal mass flow meters were installed alongside the existing original meter totaling seven feeder lines to the main flare unit. The new insertion style thermal mass flow meters include a leak-proof packing gland hot-tap process connection and are mostly top mount in horizontal 8-, 6-, and 4-inch flare gas lines. Each meter provides a 4-20.mA output signal for flow and a second 4-20.mA output signal for temperature. They are installed at the plant with remote transmitter/displays in addition to the user interface provided by the data collection system to provide a local flow indication in the field. The meter’s graphical display shows comprehensive information of the process measurements. In addition to the traditional 4-20.mA analog output configuration chosen by the refinery team, the new meter is also available with frequency/pulse or digital bus communications such as HART, Foundation™ Fieldbus, PROFIBUS PA, or Modbus. The bus communications are certified and registered with HART and Foundation Fieldbus to meet refinery software requirements. The meter’s standard turndown is 100:1 with an optional 1000:1, and the insertion probe design offers little pressure drop. Developed for rugged industrial processes, this meter is suitable for operating temperatures from -40 to 850°F (-40 to +454°C). With a SIL 1 rating, this meter is certified for hazardous area operations with agency approvals that include FM, FMc, IECEx, ATEX, Inmetro, EAC, NEPSI, CPA and others. Three flow meter sensing technologies are commonly considered in flare gas measurement applications: thermal, ultrasonic and optical. Each have their advantages and disadvantages, dependent upon the full application conditions and criteria. Thermal Dispersion. All of FCI’s mass flow meters are designed with thermal dispersion sensing technology that provides direct mass flow measurement. It places two thermowell protected platinum RTD temperature sensors in the process stream. One RTD is heated while the other senses the actual process temperature. The temperature difference between these sensors generates a voltage output, which is proportional to the media cooling affect and can be used to measure the gas mass flow rate (below) without the need for additional pressure or temperature transmitters. With this direct mass flow sensor technology, the new thermal meter selected by the refinery plant team also includes built-in real-time temperature compensation. This capability ensures repeatable and reliable measurement even in applications where wide process temperature variations are present. With no moving parts to plug or foul, the thermal mass flow meter chosen for the refinery already had a proven record of performance and maintenance. Cost savings for the flare gas feeder lines at the refinery were also an objective. This meter provides gas flow measurement essential for safe and dependable refinery operations at the lowest lifecycle costs. Ultrasonic. Flow meters designed with ultrasonic flow sensing technology rely on ultrasound and the Doppler Effect to measure volumetric flow rate. 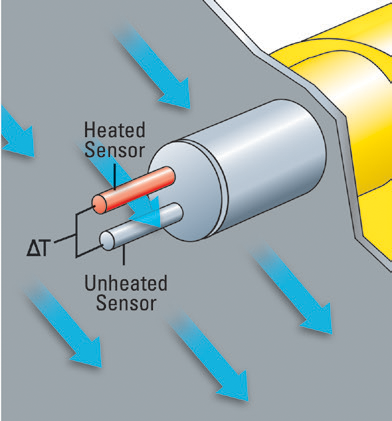 In ultrasonic flow meters, a transducer emits a beam of ultrasound to a receiving transducer. The transmitted frequency of the beam is altered linearly by particles or bubbles in the fluid stream. The shift in frequencies between the transmitter and receiver can be used to generate a signal proportional to the flow rate. Ultrasonic provides excellent accuracy, but since detector alignment is so critical, they are produced in spool-piece sections that are expensive and costly to install. Furthermore, for service or maintenance, they require adding a by-pass piping design to be able to extract the meter from the process. Optical. 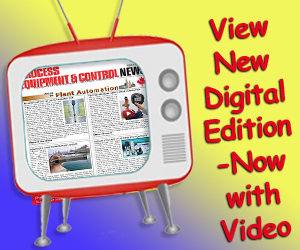 Flow meters designed with optical sensing rely on laser technology and photo detectors. This technology requires the presence particles in the gas stream. These particles scatter the light beam and the time it takes for these particles to travel from one laser beam to the other laser beam can be used to calculate the gas velocity and volumetric flow rate. These meters have good accuracy and wide turndown, but are traditionally very expensive. The refinery’s original thermal mass flow meter performed reliably on a flare gas feeder line with heavy sulfur content for 18 years with little maintenance and continues to operate today. This performance gave the refinery team the confidence to select the manufacturer’s next generation meters for future projects. The refinery staff has been very satisfied with the ST100 meters performance and the customer support from both the technical sales firm and the manufacturer’s factory team. This white paper was contributed by FCI. Authors are: Eric Benson, Environmental Specialist, HollyFrontier; Steve Cox, Sr Engineer, Fluid Components International (FCI); and, Scott Anderson, Engineer, LaTech Equipment.